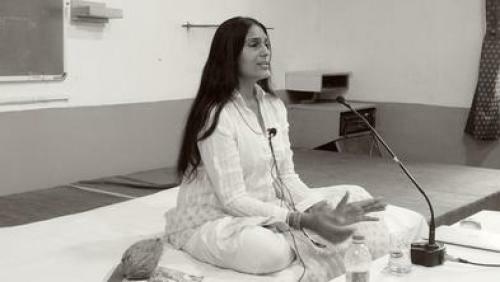 Anu Aggarwal’s transition from a glamourous lifestyle in Bollywood to living like a monk has shown her the true meaning of existence. According to the Aashiqui actor, as part of evolution one has to experience different things in life. She says her life has transformed from rags to riches to renunciation to yoga. On the occasion of International Yoga Day, Aggarwal talks to Down To Earth about how yoga helped her make a near-impossible recovery after a fateful accident. For her yoga module, anufunyoga, she was invited by the Yoga Research Therapy Association in the United States, which ranked it as an alternative yoga therapy. Why did you start practising yoga after that fateful accident? Did you feel that somewhere down the line it will cure you and make you lead a normal life again? Let me set the record straight. Yoga came first, my near-fatal experience or accident came later. I am fortunate to be a child yogi, who started yoga at five. This was owing to my deeply spiritual family and progressive mother, who learnt and started teaching yoga in DU (Delhi University) where we lived. As I grew up, sports and academics grabbed my focus. My acting skill got noticed after I was selected in a school play. So, when Aashiqui was offered, I had been already trained to play the orphan, introvert character, Anu Verghese, who longed for love and independence. Though stardom gave me a materialistic life, it robbed my happiness. When I abandoned a rocking career in movies/modeling (1994-5), yoga came as a rescue. In 1997, I enrolled in the Bihar School of Yoga. In 1999, I became a deathbed ‘case’ with multiple fractures, orthopaedic injuries, paralysis and deep wounds. After I miraculously recovered from coma, my gestation period was three years. I was a vegetable case, bedridden and had to learn the alphabets again. Death of a patient in these three critical years is normal. Medical science had given up on me. Doctors at this point said they could not do anything more. So, I became my own mentor. Tell us how yoga helped you embrace a normal life? Yoga has brought me happiness. It also provided me with tools to help me find it. I mastered the tools, practised them diligently and health and happiness came to me. I found that it works in the reverse–when you embrace yoga, life embraces you by default. So, one has to work towards a higher goal of self achievement, which yoga provides and your personal life gets sorted. My ‘miraculous’ healing is totally experiential. I was lucky to be born again. Does yoga face a challenge in India from aerobics and gym? Though Bollywood celebs Kareena Kapoor and Shilpa Shetty swear by yoga, the tilt is still more towards gyms. Health, fitness, wellness and beauty have to go hand in hand. This ‘body fitness’ cult is new in India. Even though India is shining, we still have centuries of ignorance. Owing to international modelling, I went to my first gym in New York in 1988 and did some weights and aerobics at a time when it was okay for heroes in India to have paunches! Even in 1990, when Aashiqui released, women wore falsies. We were so far away from international taste, style and fashion. It is a pity to see India whose ancient heritage is yoga so behind time. Gym is a recent phenomenon. From a model and actor to someone working with children and adopting a minimal lifestyle (you have also written a book), what made you do this 360 degrees shift? Well, deep meditation has shown I am all these in different parts. Even though to the normal eye it may seem as a dramatic or extreme shift, I have accepted myself. I may be seen doing a certain activity, like for instance, teaching yoga and living a simple life for 20 years, but that does not mean I am not an actor or a model or an once fashion icon, who cannot adapt to fashion today. If I accept an offer and act today, I would brilliantly perform.